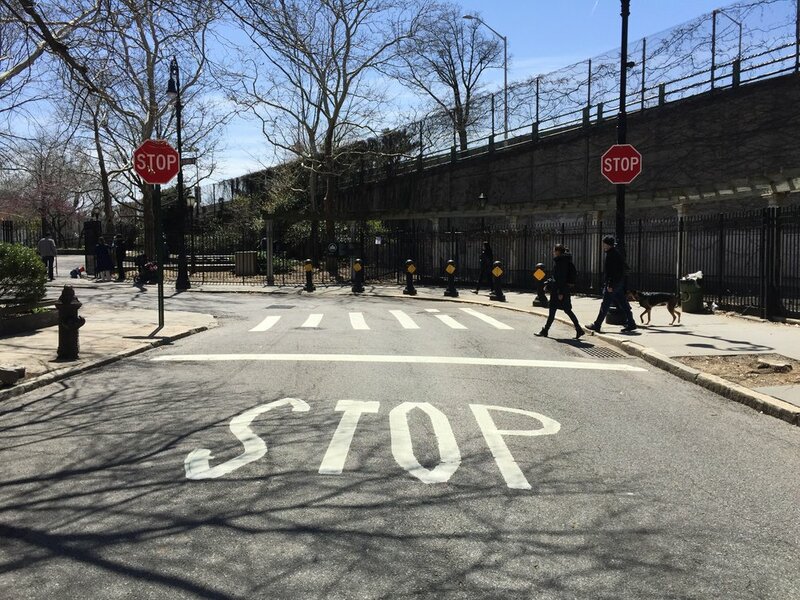 For nearly ten years, Willowtown's own Tim Hoenig watched the intersection of Columbia Place and State Street, often from the vantage of "Bear Park" (Adam Yauch Park), wondering when a speeding car would round the corner and injure an unsuspecting pedestrian, bicycle rider, or skateboarder. And so in June 2017, he filed a request at nyc.gov for improved signage around the park and a cross-walk. In short time, Willowtown's President Linda DeRosa alerted her contact at DOT, Abigail Inker, of Hoenig's request. They were informed by DOT that new signs would be installed in the months ahead. Imagine Hoenig's delight when he noticed a DOT employee taking measurements late in the fall of 2017 for the installation of the requested STOP sign. Now, a new cross-walk, park signs, and STOP sign have improved the quality and safety of the intersection.